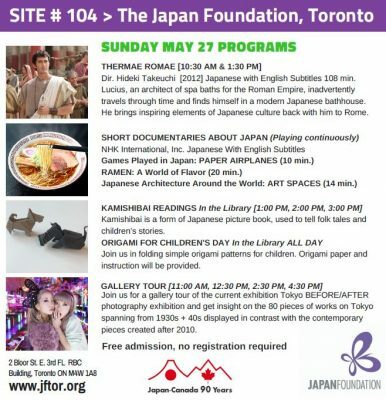 The Japan Foundation, Toronto is pleased to be part of the 2018 Doors Open Toronto! 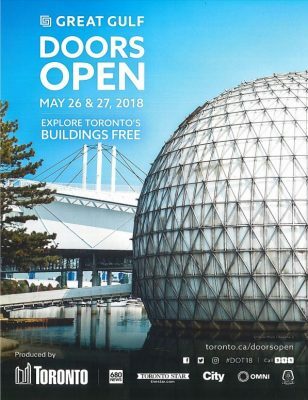 More than 130 buildings across Toronto open their doors over the May 26 – 27 weekend. Dir. Kenjiro Fujii  Japanese with English Subtitles 84 min. This documentary follows the life of charismatic photographer Daido Moriyama in the present, which has never been revealed before. The film also features fellow photographers Nobuyoshi Araki and Kazuo Nishii. NHK International, Inc. Japanese with English Subtitles 44 min. Dir. Hideki Takeuchi  Japanese with English Subtitles 108 min. Lucius, an architect of spa baths for the Roman Empire, inadvertently travels through time and finds himself in a modern Japanese bathhouse. He takes elements of Japanese culture that he is inspired by, and brings it back with him to Rome. Kamishibai is a form of Japanese picture book, used to tell folk tales and children’s stories. Join us in folding simple origami patterns for children. Origami paper and instruction will be provided. The library has an extensive film collection can be found in the JFT public lending library, with more than 22,000 Japan-related print and audio visual materials in English, Japanese and French. This includes over 1,500 film titles in various formats and over 200 books on Japanese film and cinema. Visitors are welcome to browse the collection or watch films at the viewing stations. The diverse film collection ranges from classic films to contemporary anime features. Genres include; action, anime, children, comedy, crime, documentary, horror, jidaigeki, SF, teen, thriller, and yakuza films. Join us for a gallery tour of the current exhibition Tokyo BEFORE/AFTER photography exhibition and get insight on the 80 pieces of works on Tokyo spanning from 1930s + 40s displayed in contrast with the contemporary pieces created after 2010. Located in the heart of the city, Japan Foundation Toronto (JFT) is on the third floor of the 35-storey Hudson Bay Centre, which comprises a 535,000 sq ft office tower, the Bay department store, Marriott Hotel, condominiums and an extensive retail concourse with a variety of shops and services. The tower stands at 135 metres in height and is at the northeast corner of Yonge and Bloor Streets. The International Style office skyscraper was designed by architects Crang & Boake in 1973. The Japan Foundation Toronto established its office and cultural centre in the Colonnade in 1995 and was designed by international and Canadian design icon Yabu Pushelberg. In 2015, the office moved to the current location and was designed by the global firm Interior Architects. The inspiration of the modern interior can be traced to design elements of traditional Japanese interiors.